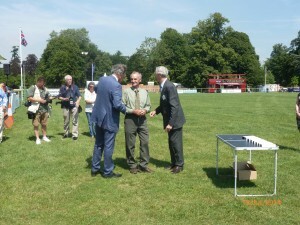 Mr Peter Groom, the Llandudno Estates gamekeeper and woodland manager was awarded his long service medal (50 years) from the Duke of Marlborough at the CLA’s annual game fair which this year was held at Blenheim Palace in Oxfordshire. Peter joined the Company in 1964 at the tender age of 15 and worked under the direction of his father, Mr Dennis Groom, who himself was the Estates gamekeeper for 60 years until his retirement in 1984. Richard Thomas, Land Agent, said “Peter has been a fantastic servant to the estate. He has worked like a trojan for 50 years to maintain and improve the woodlands. It is a pleasure to work with him – nothing is too much trouble“.